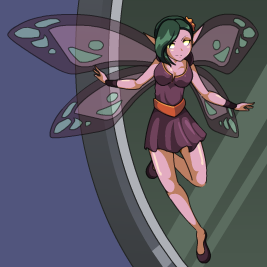 Description: These adorable faeries are some of the most annoying foes in the lands DragonFable heroes journey in. Dodging blows between swings of a hero's blade, as they flit and flutter until they drop you dead! Ours a MUCH more pliable, happily ready to adventure alongside you! This item is themed from Minx Fairy from DragonFable. Thanks to HunterCurtis, LLBALDWINLL and Mekoolness.